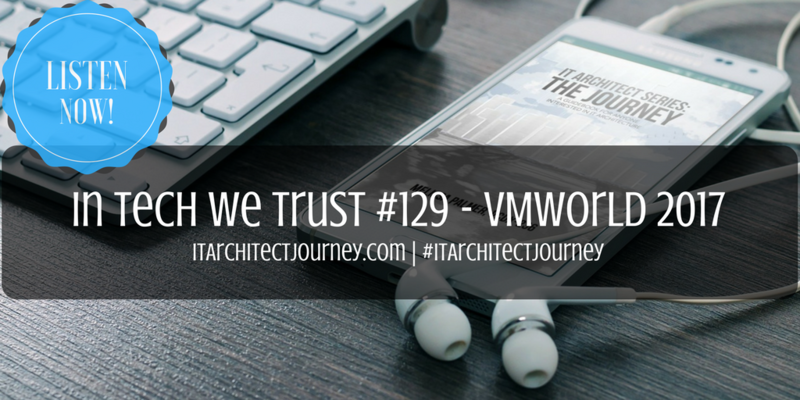 Home/Podcasts/Get in the #VMworld Spirit With In Tech We Trust Podcast #129! Are you getting ready for VMworld? 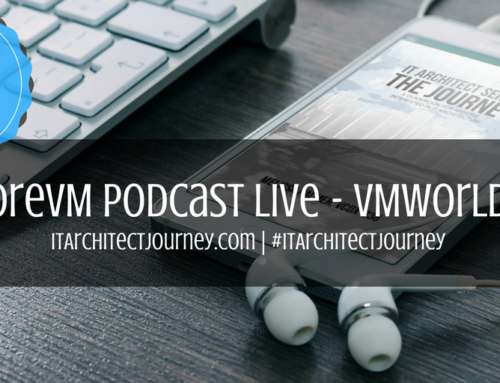 Be sure to listen to In Tech We Trust Episode 129 from VMworld 2017! In this episode, I join Yadin and Rick to talk about VMworld 2017, and the creation of IT Architect Series: The Journey. When you are planning your schedule for VMworld this year, do not forget to put in time to head over to the blogger lounge. My favorite part of VMworld is always meeting fellow bloggers and community members in person. VMworld, like many other technology conferences, is a unique opportunity to network with likeminded individuals. While there are undoubtably many great technology announcements during a conference such as VMworld, the people aspect is not something to be overlooked. In IT Architect Series: The Journey I talk about the two types of skills needed for an IT architect. These skills for IT architecture of course include the technical skills, but there is another area that is often overlooked. These are the softer skills needed, such as communication and writing skills. A great way to sharpen these skills is to network at a technology conference such as VMworld, and write blogs! You can learn more about these skills, and why they are important in IT Architect Series: The Journey. Click here to listen to In Tech We Trust #129!